Card 1. 2003. No sellers details recorded, only the price achieved. Card 2. 2006. No sellers details recorded, only the price achieved. Card 3. 2008 Postcard of North Corner, Boats, People. 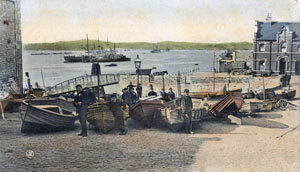 Postally used 1906. Has a divided back. Publisher is Unknown. This front of this card has cancel markings in the sky and there is corner bumping. 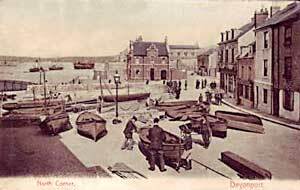 SELLER'S DESCRIPTION:c1900s Postcard North Corner Devonport with a Pickfords hand-pulled van. Published by Valentine Series, No 46781. Condition is good except for minor scuffing to corners, and small bends top and bottom left corners. Postally used with 1/2d stamp. 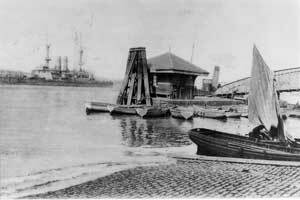 SELLER'S DESCRIPTION: Super printed card of the Landing Stage North Corner and HMS Hood, Devonport. Postally unused. Someone has written HMS Hood 1891 on the back - The condition is not bad - but the edges are a bit worn, there is a small tear at 5pm at the foot of the card (though this does not extend into the main picture and is confined to the "frame" and there is a gentle biro line running from the right of the sail (mid right) up to the top of the card. All in all though, I suspect this is a pretty unusual card. This is NOT the same Hood that was sunk by the Bismarck. The Hood pictured is her predecessor, the pre-dreadnought battleship.